As the weather is starting to cool down and a few more rainy days appear on the radar, its time to look ahead at what’s happening in the Garden City over the next few months. 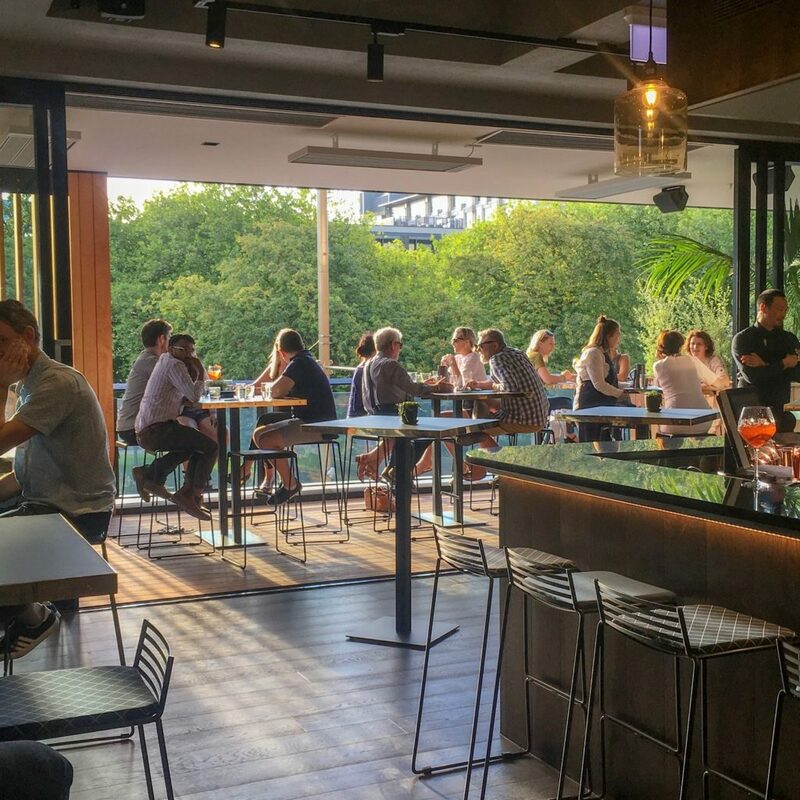 While the recent tragedy has had a serious impact on locals and visitors alike, the Christchurch community is still finding ways to come together and enjoy each other’s company and forms of entertainment that lift spirits all around. In the last few decades there has been a trend towards movies and stage musicals based around some of our favourite rock bands and performers, linked into a narrative – Mama Mia, Across the Universe (the Beatles) and mostly recently, NZ’s own Daffodil all come to mind. 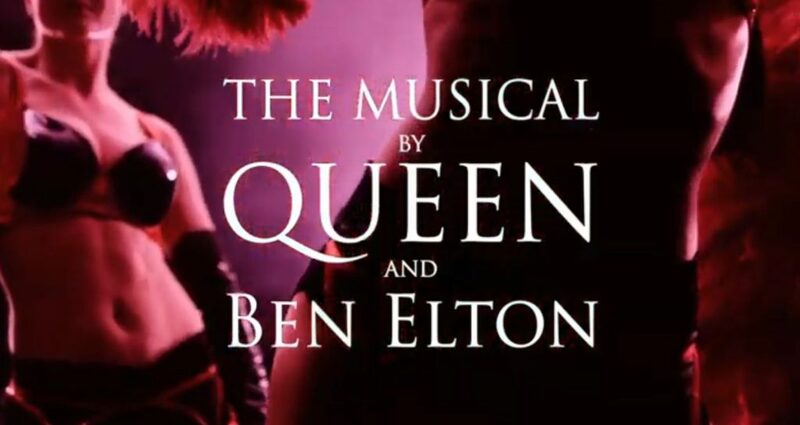 And We Will Rock You is of course based on the music of rock super band, Queen. Imagine a world without rock music under the control of an all-powerful global company and its tyrannical boss, Killer Queen. Scaramouche and Galileo, two young outsiders, cannot come to terms with this bleak conformist reality. They join rock rebels the Bohemians and embark on the search to find the unlimited power and freedom of rock music. We Are The Champions, Radio Ga Ga, I Want To Break Free, Somebody To Love, Killer Queen, Don’t Stop Me Now, Under Pressure, Bohemian Rhapsody and We Will Rock You. This is a night to remember, performed by the talented cast of Showbiz Christchurch. Book your tickets here. The perfect venue for all Christchurch food lovers, The Food Show is where you can try and buy the very best local and international food, wine, beer and so much more! If you love to cook and entertain, The Food Show is the perfect spot to gather inspiration. Discover recipes and hot tips from top celebrity chefs in the NEFF Cooking Theatre or if you’re looking to find the best deals, don’t look past the incredible show only offers from over 120 exhibitors. Don’t miss show features, with something for everyone including Street Food Alley, Cheese Alley, Artisan Village and the Healthy Hub. All demonstrations and feature zones are included free with your entry ticket. Culinary guest speakers this year include all the favourites – Annabel Langbein and Annabel White, Josh Emmett, Jax Hamilton, Giulio Sturla and Luke Hines. You can book tickets online right here. And while you’re booking you can also contribute $2 to this year’s charity which is the Christchurch City Mission. Performers include Lorde, Anika Moa, The Adults, Bailey Wiley, Bic Runga, Dave Dobbyn, The Exponents, Fat Freddy’s Drop, Hollie Smith, Marlon Williams, Shihad, Shapeshifter and Stan Walker, along with many more. Ticket prices are Adults $79.00 Children (12 years old and under) $39.00. The ‘Come Away With Me’ singer will perform in Christchurch on April 29. This tour will be the pianist/vocalist’s first performances in New Zealand in 14 years. Jones’ 2002 debut album, Come Away With Me, was a massive global phenomenon, selling over one million copies in Australia alone and 27 million globally. To date, she has sold over 50 million albums worldwide. From jazz to country, folk, rock and soul, Jones is a singular talent whose work crosses all the boundaries of American music – as evidenced on her chart-topping solo releases. 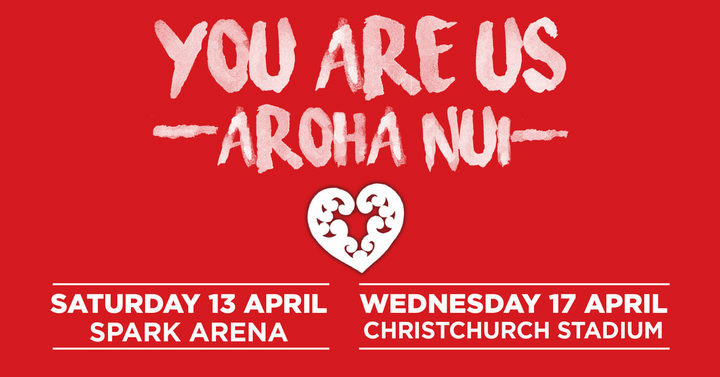 Tickets to the Christchurch concert are still available here. 2019 marks the 39th running of the South Island’s favourite foot race. Inspired by the 1974 Commonwealth Games marathon, the Christchurch Marathon event is renowned as one of the fastest courses in the world and for the first time since 2010, it will be returning to the Town Hall as the location the Start/Finish line, prizegiving and venue for picking up race packs and more. The Christchurch Marathon is also one of the most scenic and supportive, welcoming all age & ability for a flat, fast and scenic tour around iconic Christchurch landmarks such as Cathedral Square, Hagley Park, the Avon River & the Red Zone. With a Full Marathon, Half Marathon, 10k & Kids’ Mara’Fun available, there is something for everyone. You can now submit your race entry online here, and find out more about the event and the course through the website here. The Jane Goodall Institute New Zealand & Loop welcome Dr. Jane Goodall back to New Zealand to help us Rewind The Future. Discover how Dr. Goodall and her Institute are helping to rewind the future for planet earth. Dr. Goodall will speak about devoting her life to making a difference for all, and the power of individual action to enable us to change the course of time. Through her work and that of her Institute, Dr. Goodall has seen the mounting global crises that we currently face first hand, such as climate change, environmental degradation, poverty, and global conflict. These talks will touch on Dr. Goodall’s incredible life story, along with solutions to these problems to help turn back the clock and create a future where people, animals and the environment live in balance. Dr. Goodall will be joined by very special guests to be announced, and a presentation from Dr. Goodall herself. Proceeds from each event will go directly to the Jane Goodall Institute New Zealand, assisting the important work they do to help create a better world for people, other animals and our shared planet. Buy tickets for Dr Goodall talk here. What’s New on the Streets of Christchurch? 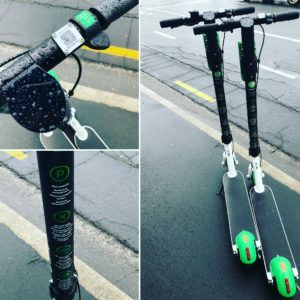 Over the next three months, anyone moving around Christchurch will have the chance to pick up an electric scooter from Lime and use it to ride to their next destination. The location of individual scooter is easy to find on the Lime app, and once you have used the scooter you can take a photo of it at the location you have parked and upload back to the app again, ready for the next user. there are hundreds of scooters all over the city during the trial, so look out for them and enjoy a trying a different way to get around the city for a change! They are for use on footpaths only at this stage, so keep a good eye out for pedestrians and ride safely. One of many awesome Gapfiller initiatives around the central city, the Street Arcade on the corner of High Street and Tuam Street (just across the street from Little High Eatery) has been a highlight for many visitors to the city – and locals alike. 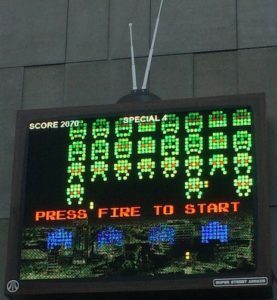 For a totally unique experience, head on down for a game with a friend or two – use the human size controllers to play a game of Space Raiders, inspired by the original Space Invaders video arcade game. Gapfiller say this installation won’t be here for ever, so make sure you get down to High Street and try it out – you won’t regret it! 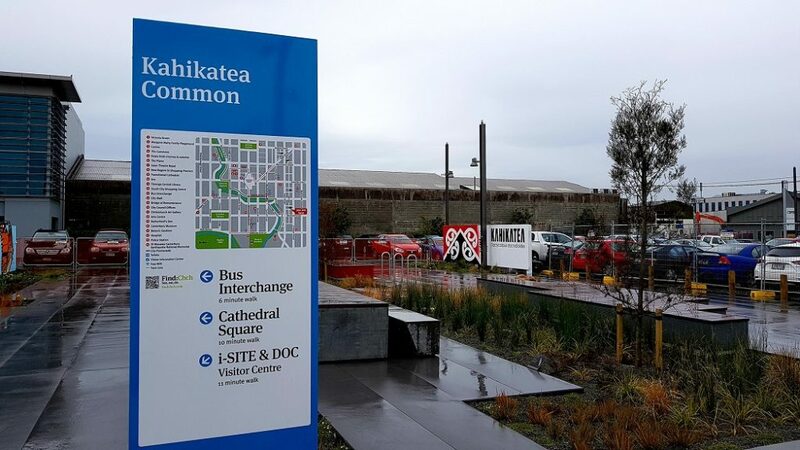 One of the very newest space filler initiatives to open in the city is Kahikatea Common, part of the South Frame and located between the one way streets of Durham and Montreal. The site includes a roofed area, a community pizza oven available for anyone to use, and a Monarch butterfly hatchery. Creators of this space hope it will encourage groups to use the area and that the community in general will find it somewhere they can connect with others in the central city. And of course, visitors to the city are most welcome! If you are planning to drive into the CBD, you might want to try out a different sort of car parking for your visit. 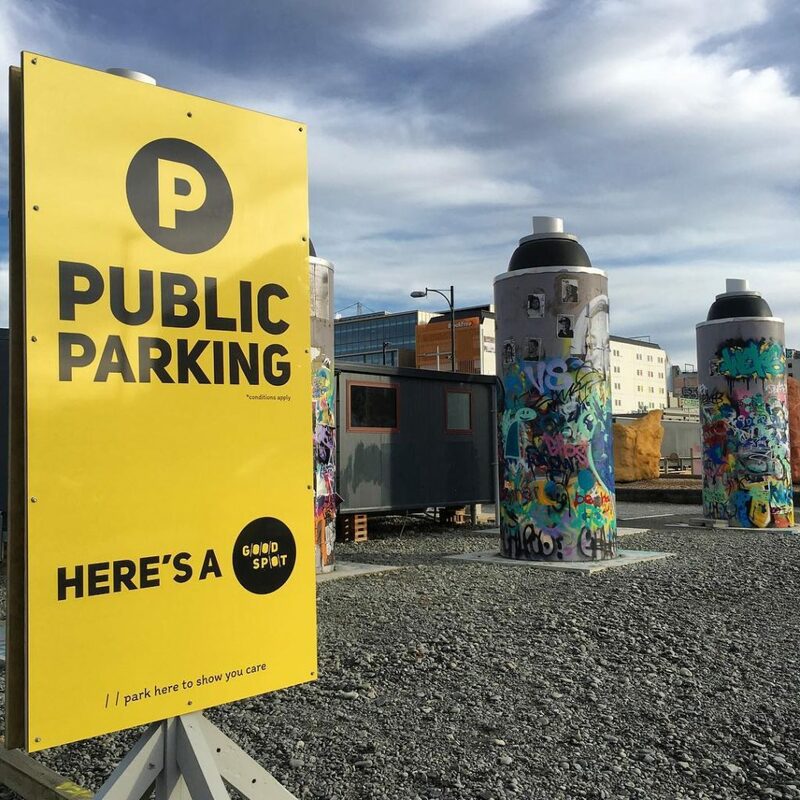 You can of course use any of the brand new parking buildings, or you can support the “good sort” car parks run by the Gapfiller team which has their own volunteer parking attendants happy to hold an umbrella while you pay for your parking, always has a happy greeting to share, and you also know that your parking fees go directly towards supporting community group initiatives. 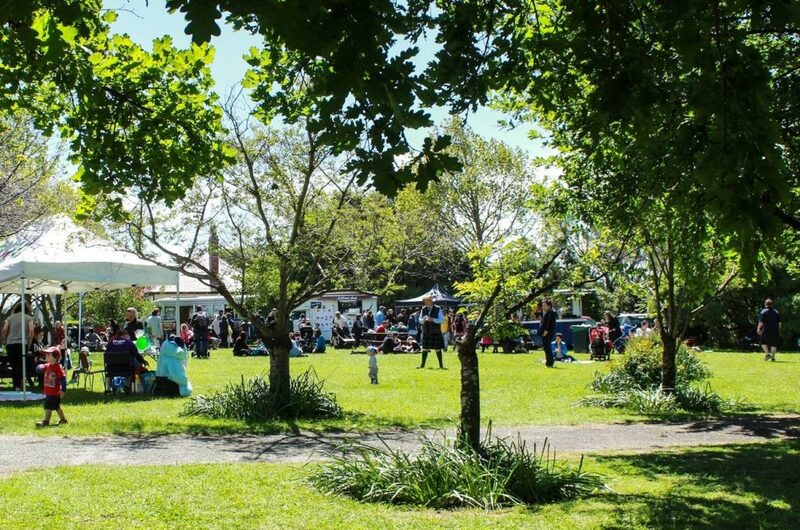 As we head into the warmer months, the events and activities on around Christchurch start to rapidly grow in number, kicking off with the upcoming Labour Weekend festivities. This year will be the third FESTA event and the focus this year is on food and family. Architecture and design students from around New Zealand and Australia have been working on interactive installations that will be located around the central city and there’s also a programme of events running from Friday October 19th through to Monday 22nd (Labour Day). The highlight of the event will be held on Saturday night (postponed to Sunday if it rains) and is called FEASTA! A giant free street party for people of all ages including the lit up installations, food stalls, entertainment and much more. Check out the FESTA website for more details about the Saturday night event and the other 50+ events and activities happening over the long weekend. Produced by the Christchurch City Council, this year’s event will deliver a pyrotechnic display set to Anthems of Rock. So make tracks with your whole family to New Brighton Mall from 6pm for local food options and then to your choice of viewing location. Most of all, open your eyes and look up to the skies from 9pm for a spectacular fireworks finale on the Pier! This is always a busy event so plan your travel in advance – parking options are limited so if aim to share a ride, use public transport, or park at a friend’s place. Road closure information is right here on the CCC website. Central New Brighton either side of the Pier through our sound system. North Beach Surf Life Saving Club. South Beach Surf Life Saving Club. The hills around Pegasus Bay. Don’t forget to listen to the More FM broadcast by Lana and JMac on 92.1FM! Note that this event is an alcohol-free zone. It’s been 20 years since SCAPE Public Art began to revolutionise the open spaces of Ōtautahi Christchurch. The Season 2018 is a chance to celebrate the 216 temporary artworks that have popped up during our Seasons and the 14 permanent artworks contributed to Christchurch over the years. Managing Curator, Heather Galbraith has developed a programme that draws together different strands from SCAPE’s history, integrating past works, and looks toward the future with new and existing works contemplating our relationships to land, sea, language, cultural and political agency and expression, how histories are told and retold, the built environment, and even the cosmos – Our Braided Future being the theme for the Season. If you’re interested in checking out what the SCAPE event has in store for 2018, check out the programme here. Running from 10-17 November 2018, this popular annual event brings together Addington Raceway’s Christchurch Casino New Zealand Trotting Cup Day, the New Zealand Cup Meeting at Riccarton Park and the New Zealand Agricultural Show. Highlights this year will include a new spring garden experience in the surrounds of Riccarton Park, fashion and entertainment at Addington Raceway and the opportunity to combine family fun with innovative agribusiness at the NZ Agricultural Show. And if all of the above isn’t enough inspiration – check out these incredible sheep that will be on show for the first time! 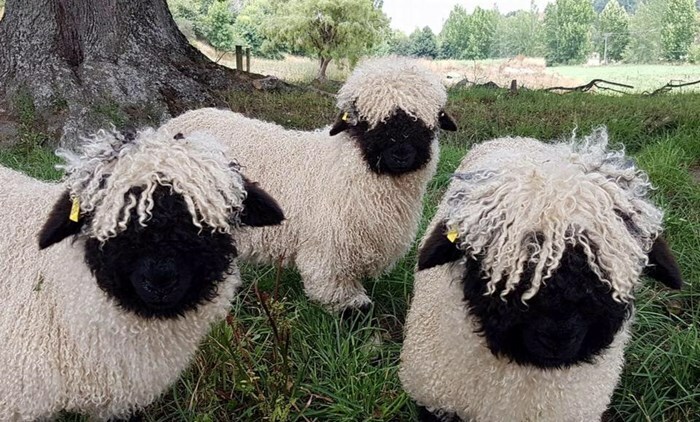 the Valais Blacknose will be a highlight for lots of families at this year’s event. Celebrate with 80 of the South Island’s leading winemakers and food producers in the picturesque North Hagley Park. 40 wineries are joined by the region’s biggest names in food – local restaurateurs, gourmet food producers and street food stalls complement the range of wines on show. This popular annual Festival includes interactive wine seminars & workshops hosted by Masters of Wine and sommeliers from New Zealand and overseas. Don’t miss the Cooking Theatre, where you’ll be treated to live demonstrations from Kiwi chefs – or kick back and enjoy live music talent onstage amongst the trees. It’s usually a beautiful sunny day for this event, so be well prepared (and well hydrated) with hats, sunscreen and something to sit and relax on. Tickets are still available for the various options and start from $53 per person plus booking fees for entry. General Admission on the day at the gate is $55.00 but numbers may be limited depending on pre-sales. Perfectly timed for the school holidays and with lots of family and kid friendly options included, the annual Breeze Walking Festival kicks off very soon. With over 50 walks to choose from there is something for all ages and abilities. From child-friendly strolls and energetic treks, to informative ambles through the central city, the organisers have catered for all interests and ages. The various events cover Christchurch, Waimakariri and Selwyn District, so no matter where you are or where you would like to explore, there are plenty of options. The walks have been designed to appeal to those wanting to embrace nature, culture, the arts, history and new developments around our city. 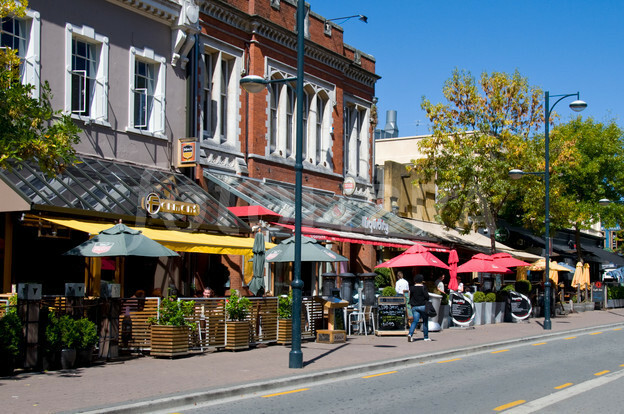 If you don’t live in Christchurch, check out in particular the inner city walks that will give you some insights into the new CBD – exploring the changes that have taken place over the last eight years. The full programme of events can be found here but we have included some of the highlights below to give you a taste of what’s on offer. Most of the events are free and they are also marked to indicate if they are child or family friendly. Note that some of the events do require you to book in advance that you will be participating. Explore the newly emerging South Frame on foot, including all four of the new gathering places dotted along Te Ara Pū Hā: The South Frame. From Kahikatea Common at the Health Precinct end. Take away a scavenger hunt created by kids for kids, which you can use to help share your newly learned stories about this walk. Postponement date: Sunday 30 September 2018. Grade: Easy – flat terrain 30 to 60 minutes. Suitable for: Children in pushchairs/buggies and people using wheelchairs. Can cater for dogs (on a leash at all times). Bookings required: Call 03 357 6300. This will be a great day for families, children and the household dog/s! Combine a guided scenic walk with all the fun activities Ferrymead has to offer, including tram rides, free micro chipping for Christchurch registered dogs, and lots of treats for dog lovers of all ages. Bring your own picnic, and light refreshments will also be for sale. Meet at the Ferrymead car park (first right off Ferrymead Park Drive, off Bridle Path Road, Heathcote). Grade: Easy to flat terrain, 30 to 60 minutes. Pre-schoolers are free. Children aged 16 years and under $2, adults $5 (please bring cash, no eftpos available). No bookings required. This is a great one to enjoy, especially if you haven’t spent a lot of time exploring the new inner city of Christchurch. Travelling by foot, weave through the central city exploring and learning as you go. We will share tales of the old, the new and the bold and bring to life many of our hometown’s hidden secrets. Time of day: 1pm – 2.30pm on Sunday September 30, 9.30am – 11am on October 1 and 6. Starts from the Godley Statue in Cathedral Square. Join your fellow walkers for a stunning walk watching the sunrise over New Brighton Beach. Heading north along the dunes and back along the beach, watch the sunrise over the sea with stunning views of the Kaikoura ranges, Brighton Pier and the Port Hills! Why not arrange to finish your walk with brunch at the Beach Cafe or Salt cafe at the Pier. Postponement date: Cancelled if raining. Grade: Easy – medium, mixed terrain one to two hours. Meet at New Brighton Clock Tower, Marine Parade. What’s Happening in Christchurch Spring 2018? With the next set of school holidays not much more than a month away, Spring weather inspiring us to get outdoors and enjoy the sunshine and spring blossoms, what’s in store around Christchurch in terms of events and happenings over the next two or three months? Plenty it seems! 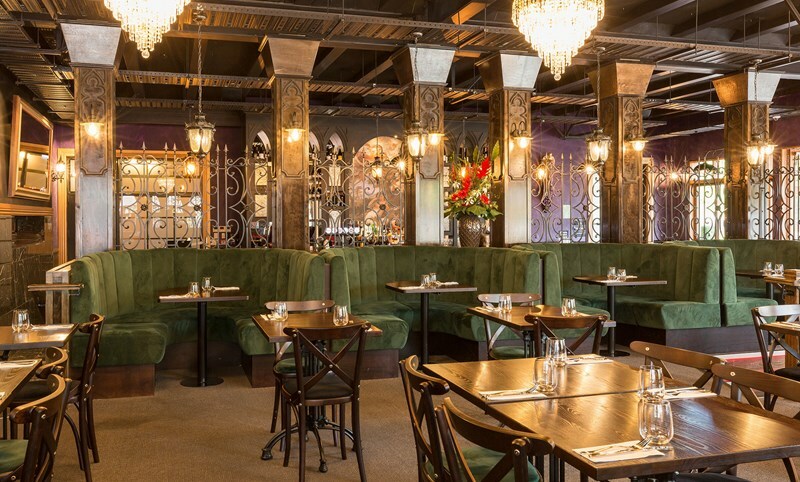 We’ve included a selection of events in this blog for you to mark in your calendar and plan a trip to the city around, or simply enjoy attending if you happen to already be living in Christchurch. 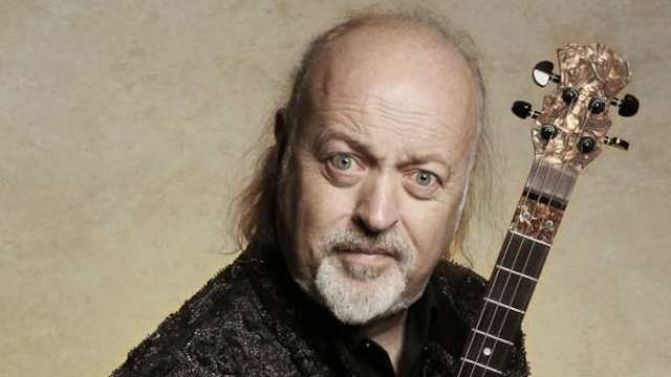 After his 2016 sell-out tour, Larks in Transit, the UK’s very own straggle-haired polymath, Bill Bailey, returns to New Zealand with his new comedy and music extravaganza, Earl of Whimsy. It has Bill’s trademark blend of satire and surrealism, stories and dismantled jokes, crowd sing-alongs, weird instruments and musical showstoppers. But there’s a distinctly historical feel to this show. With its tales of Britain’s fortunes past and present, of ancient Viking battles, of Shakespeare’s contribution to comedy, and Bill’s own ancestry, this is both a mockery and a celebration of national identity. If you are a Bill Bailey fan and you haven’t already booked for this show, there are still tickets left so it’s not too late! New Zealand Theatre Month is for everyone who loves theatre, for audiences and supporters as well as theatre makers, educators and other creatives. With the generous support of both Christchurch City Council and ASB the Isaac Theatre Royal has put together a full programme of events within the festival, as well as developing a city-wide brochure highlighting the multitude of NZ Theatre Month shows and events being presented throughout Christchurch. Check out the Isaac Theatre Royal website for information about the shows and events that are happening across September as part of NZ Theatre Month. This is a new production of Boublil and Schönberg’s Les Misérables at the Isaac Theatre Royal – the perfect setting for this classic musical based on the book by Victor Hugo. The epic tale of broken dreams, passion and redemption set against a nation in the throes of revolution. Winner of over 100 international awards and seen by over 65 million people worldwide, Les Misérables is an epic and uplifting story about the survival of the human spirit. This Showbiz production will be directed by Stephen Robertson with musical direction by Richard Marrett. This night market runs monthly on the first Saturday of each month and is a great evening for all ages. Entry is by a gold coin at the door. Take the night off cooking and come a get something delicious to eat at one of the food vendors. Craft stalls, bouncy castle – candy floss and snow cones, face painting and music. Have a Twilight ride on the Vulcan railcar or a ride on the tram – only $2 a ride. It will run from 5pm to 9pm October to May and 4pm to 8pm April to September. Check out the Ferrymead Night Market Facebook page for updates. The biennial FESTA event has been happening since post quake Christchurch started getting back on its feet and brings life into the central city, intertwining entertainment with art and interactive architectural installations. This year’s theme explores the connections between food and the city through workshops, talks, pop-up projects, meals, family events, tours, live performance, artworks and more. These take place at various venues across the city over the course of the weekend, beginning on Friday morning (19 October) and ending Monday night (22 October). FEASTA! is this year’s headline event – Christchurch’s biggest and brightest street party. This public feast of architecture, community and food is free and open to all. On Saturday 20 October artists, musicians, community groups, businesses, over one hundred architecture students from across Australasia, and design and architecture professionals will come together to create a spectacular celebration of food and city-making, live for one night only (rain date 21 October). Check the festa website for more information on all the events and activities happening across Labour Weekend. This event is really worth planning a trip to Christchurch around! Of course one of the big drawcards bringing people to Christchurch is the annual Cup and Show week, which is focused around Canterbury’s Show Weekend public holiday. If you are planning to get into the city to enjoy the events from the annual New Zealand Agricultural Show (formerly the A & P Show), through to the horse and greyhound races at Addington and Riccarton Racecourse, and Fashion in the Field, check out what’s in store this year right here. We recommend you get onto our site to book your accommodation well ahead of time, as Cup and Show Week is always very busy. Finding affordable ways to keep your family entertained during a trip to Christchurch can make or break a holiday to the Garden City, so we have put together some of the things we recommend you do with your children around Christchurch. We also love having families come to stay with us at the Airport Gateway, so don’t hesitate to talk to our friendly reception team about the best options for your stay – we have spacious rooms and plenty of multi bedroom options with self-catering kitchens to fit the whole gang. Due to open on October 19, 2018 this is going to be a pretty extraordinary library. Of course it will be the most modern in the Southern Hemisphere and one of the largest in the country as well. Lots of things to do and explore in addition to the books. The entire library is a digital hub supported by a variety of high-tech features including virtual reality headsets, gaming consoles, laser cutters, digital walls, 3D printers and an interactive touchscreen sharing the history of Canterbury. If your family enjoy spending time in the water, check out the brand new QEII pool and hydroslide built on the old site on Travis Road out towards New Brighton. Not quite as big as its predecessor, this is still a great place to spend time with the family. Note the hydroslide is only open for children over 5 years and taller than 107cm. This is always a great option if your kids (and you) enjoy Lego. You can make any kind of creation you can imagine at the Imagination Station, which is located behind Christchurch Cathedral in Cathedral Junction. Which is right alongside the Tram Track, so for a double whammy catch the tram and do a few circuits around the city, then jump off at Imagination Station for some fun. They have some classes coming up just in time for the October School Holidays too, so get online and book if you are planning to be in the city. Nearby there are plenty of places to eat and drink in case the team gets hungry. 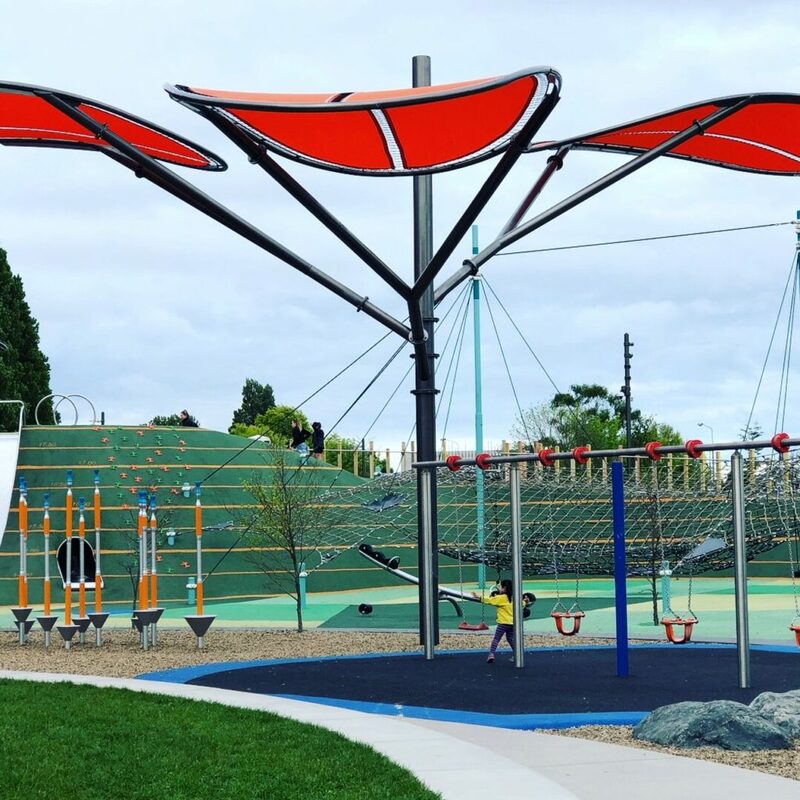 The Margaret Mahy Family playground is proving popular with kids of all ages – and at all times of day and night it seems, with plenty of the activities suitable for anyone from the very small to the fully grown! 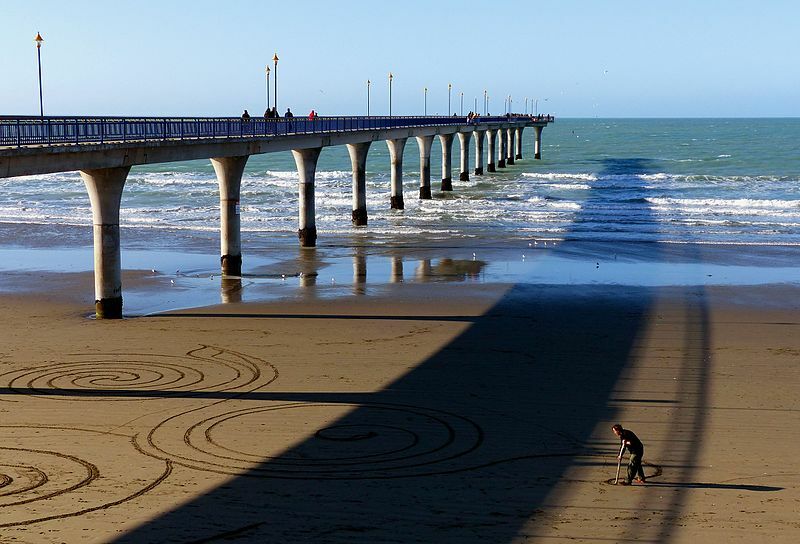 The Pier has recently been fully restored following the earthquakes so is a great place to go for a wander to enjoy the views or take your kids fishing if they are keen. The New Brighton Library building is your entry point so you can always combine a library visit with a walk on the pier, and there are cafes built into the Library as well, so all your needs are covered. Nearby is the Brighton Playground which has also been given a new lease of life, including the famous whale paddling pool. There’s a large carpark right next door and of course you can also get access to Brighton Beach to go exploring or enjoy a swim when the weather is warmer. If you are around the city over the summer months, look out for the Kite Day down at New Brighton Beach as this is always worth heading along to. Some amazing kites of all sizes will be flying, plus there is food and entertainment on offer. These are a cool creation and a wonderful safe way to take your children out riding their bikes and learning some onroad skills – without actually being on the road. Even better, these parks are completely free! 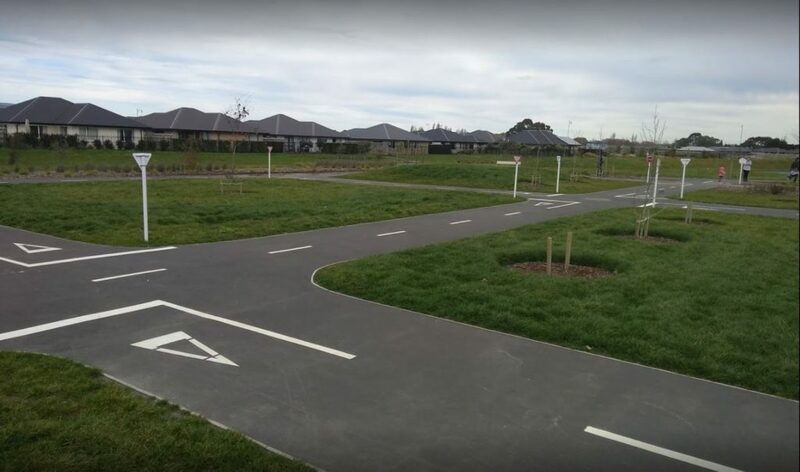 Westburn Reserve is just a few blocks away from us in Burnside and the new Knights Stream bike skills park is in Richmond Ave, Halswell. Right next to the bike area in Knight’s Stream is a skate park, and a half basketball court, so there are lots of options to keep the family occupied. 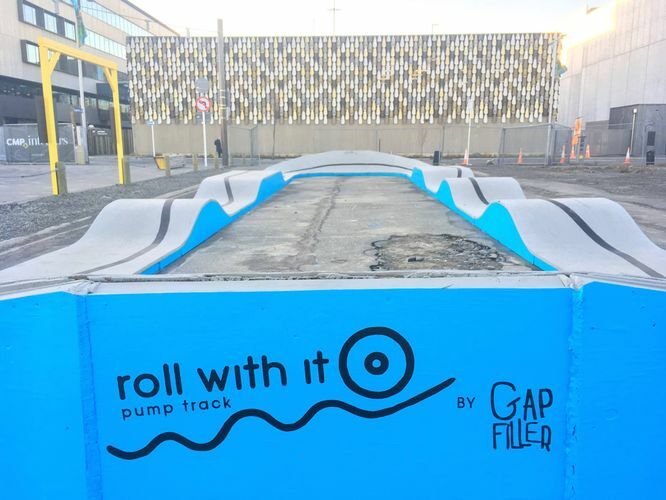 For more skateboarding and biking fun, check out the Roll with It pump track in the centre of Christchurch, which is perfect for younger kids who want a manageable amount of adventure. This is a GapFiller project and is right in the heart of the city. Head to Mollet Street, between St Asaph and Tuam (just a block away from the bus exchange). And did we mention it is free? 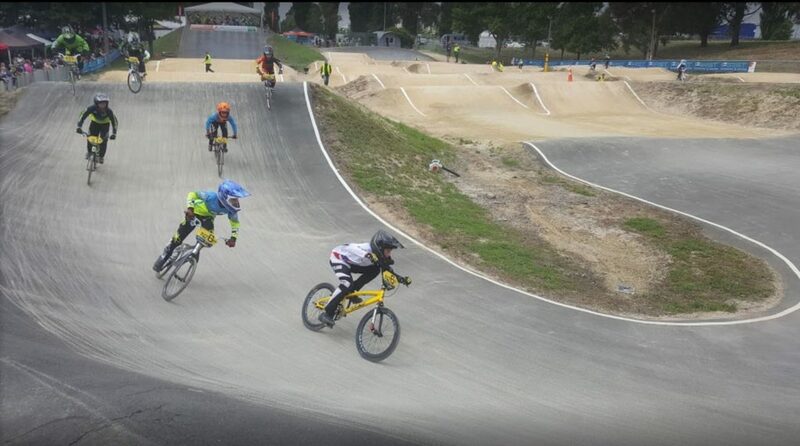 Kyle Park is a bigger BMX track located in Hornby, with all the facilities you would expect from a city BMX club. There is a membership fee to join and use the track, although the first few visits are usually free. Get in touch with the club through their website to find out more. 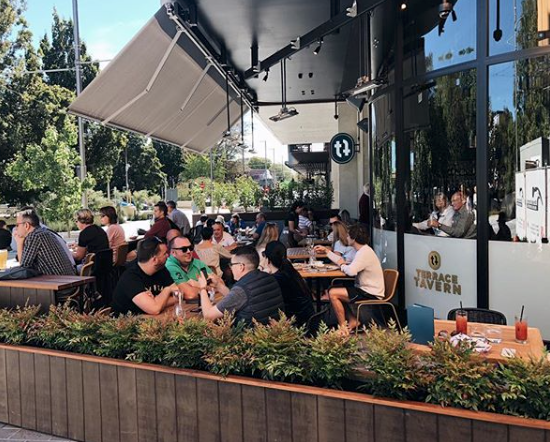 As the city continues to rebuild, new projects, buildings and businesses are popping up all over the place. Very close to completion now are the brand new Christchurch Central Library, called Turanga which is located on the edge of Cathedral Square opposite the now under construction Convention Centre. 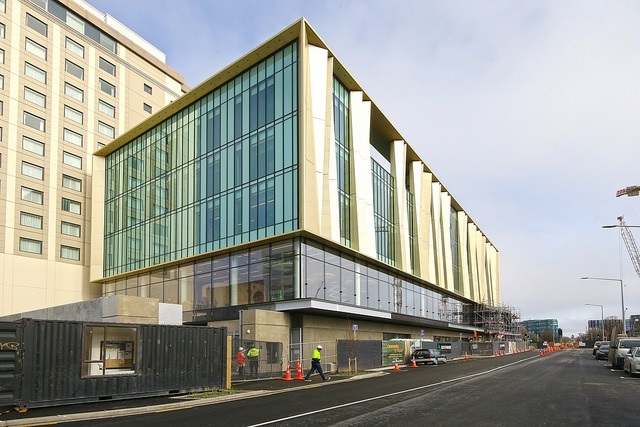 The five storey library will be the largest in the South Island and is due to open in October 2018. 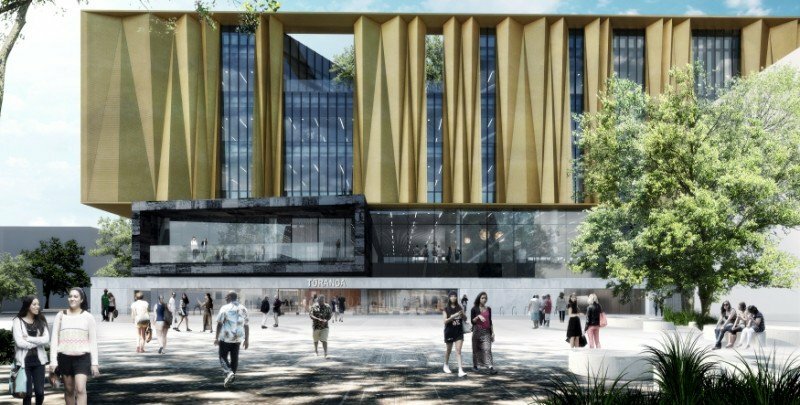 It will feature up to 100 computers, an innovation zone for trialling new technology, 3D and laser printers, music, film and video editing studios, two roof terraces and accessible balconies, a playground, a cafe and more than 175,000 books. Right in the heart of the city, the newest and most innovative movie theatre complex in the South Island is also nearing completion, and has a September completion date. It marks the return of the cinema chain to central Christchurch following the demolition of their 8 screen Moorhouse Avenue complex in 2012. 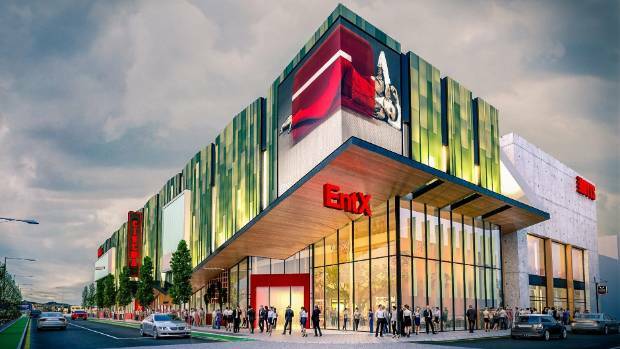 The seven-screen complex will have a food precinct on the ground floor with 17 dining outlets, two very large cinema screens and two screens featuring luxury seating and food-and-drink service. Every seat will have a recliner style chair. 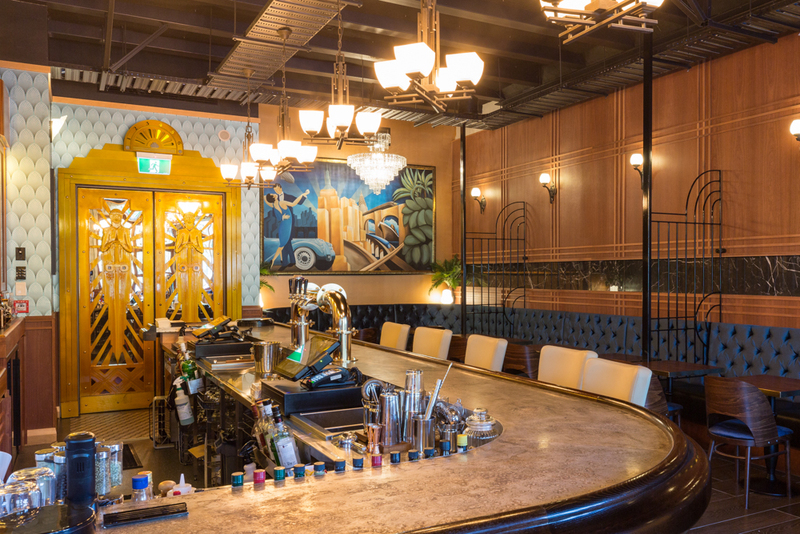 Nando’s, Joe’s Garage and Auckland gastropub Cleaver & Co will be among the restaurants in the emporium area of the complex. 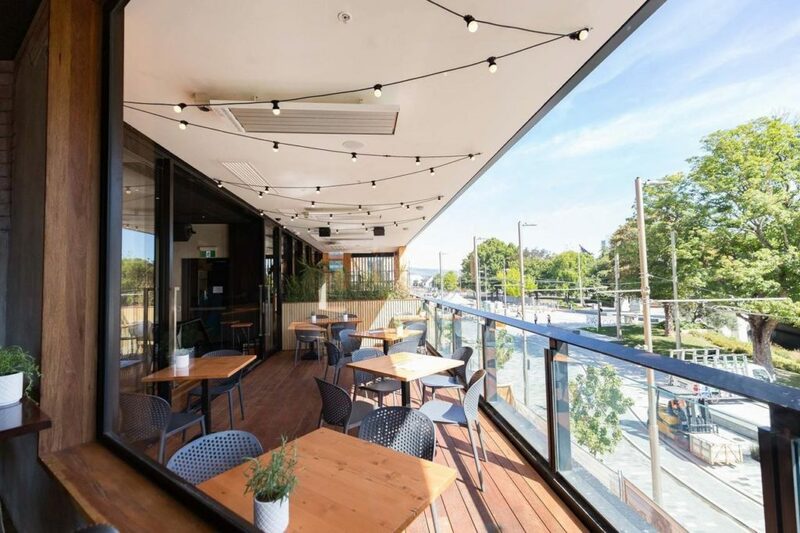 The food offering would be similar to the popular Little High eatery on St Asaph St, which has a variety of food outlets opening out onto a central indoor seating area. For those who are interested in exploring the city and like to get in some exercise at the same time, the new Te Ara Otakaro Avon River trail has recently been completed. This is a pathway that is suitable for pedestrians or cyclists and winds from the central city through the residential Red Zone and out to Pages Road, which isn’t far from the coast. 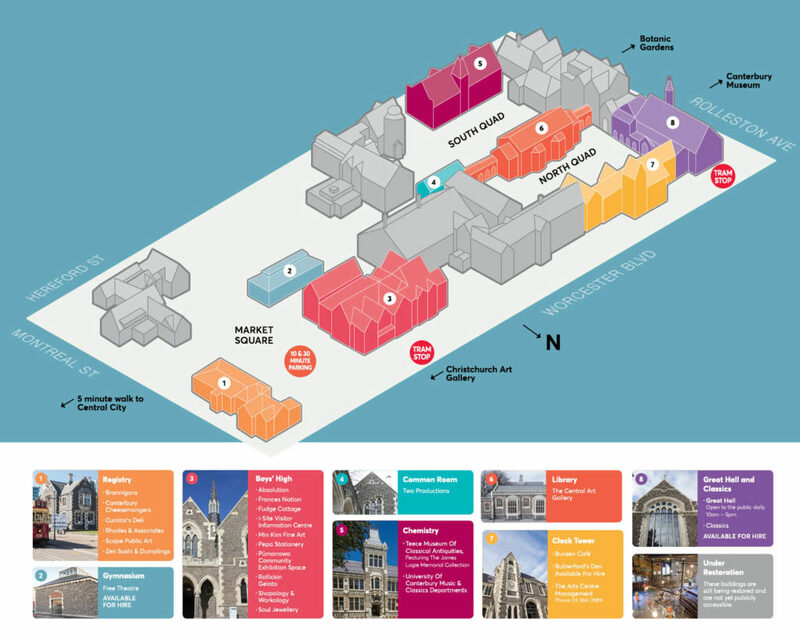 More info and a map are on the Christchurch City Council site here. The Arts Centre of Christchurch has been a wonderful drawcard for Christchurch over the years and has now had more than half it’s buildings brought back to life in an extensive post-quake restoration project. Among other things it is home to numerous retailers, restaurants/cafes, the University of Canterbury’s School of Music and Teece Museum of Antiquities, Rutherford’s Den and much more. Check out what events and activities are on year round through the Arts Centre website. One of the highlights coming up very soon is the Botanic Garden D’Lights which this year will be including part of the Arts Centre in the interactive displays. Find out more here.